Allergens are misunderstood. These irritants, which can trigger the misery of congestion, sneezing, scratchy eyes, and even asthma attacks, don’t only reside outdoors. They also flourish in your home — in your sofa, on your pet, on your floor or even next to you in bed. What are allergens? Allergens are substances that cause allergic responses if breathed, swallowed or touched. They include dust mites, pet dander and mold. These elements are harmless, but the immune system doesn’t think so. It produces substances to combat them, resulting in allergies. Mold and mildew are both fungi that love moisture. They accumulate in dampness within bathrooms, kitchens and basements. Like pollen, mold spores can become airborne and provoke allergies. In the bathroom, minimize these contaminants by exchanging wallpaper for tile. Make sure to turn on an exhaust fan after showering or bathing. Replace broken tiles, to thwart mold growth behind walls. Running a dehumidifier will reduce moisture that breeds allergens. According to the Association of Home Appliance Manufacturers, dust can gather at six milligrams per square meter per day. Dust mites thrive on dead skin cells, which are the primary elements of dust. Interestingly, carpeting doesn’t pollute the air, it maintains clear air by ensnaring allergens within its fibers where they can easily be vacuumed up. HEPA filters, or High-Efficiency Particulate Filters, are a vital addition to your vacuum. These powerhouse filters are 99.97 percent effective at capturing particulates as small as 0.3 microns. HEPA filters are crucial because they prevent dust from sifting back into the air. • Vacuuming carpets and rugs at least once a week. • Regularly vacuuming drapes, mattresses and upholstered furniture. • Vacuuming a bare minimum of twice a week if you have pets. • Getting an Air Purifier — Dander can stay aloft for hours before it drifts down, assaulting your mouth, nose and eyes midair. Time in the air is compounded by time on the ground. 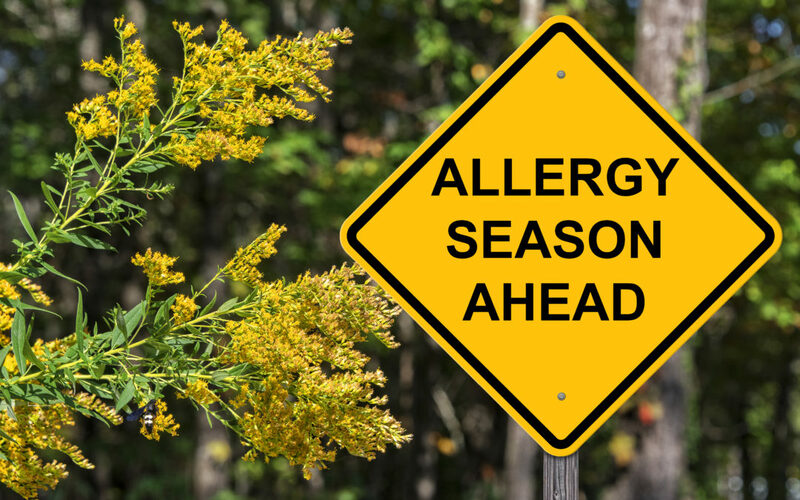 This can be double trouble for your allergies. Keep the purifier in your pet’s favorite room so you can join them there. Progressive Air Systems can aid you in abolishing airborne contaminants like these. • Covering the Litter Box — If you’re a cat person, cover your litter box and situate it far from you. You can buy plastic, covered litter boxes with easily removable lids for scooping. • Getting a Non-Allergenic Pet — Bypass pet allergies by adopting a non-allergenic pet such as a reptile or fish. However, don’t fall for the hype about hypoallergenic dogs. They shed less dander than other breeds but it’s still enough to provoke allergies. • Shut all doors and windows, especially between 5 am and 10 am when plants are releasing pollen. • Refrain going outside when the pollen count is high. • Change your clothes and take a shower when you come in. This can eliminate pollen that may have hitchhiked inside. Wash the clothes you’ve removed as soon as possible. • Sheets — Wash your sheets weekly in hot water that is at least 130 degrees Fahrenheit. Dust mites can’t tolerate extremely hot temperatures. • Scented Laundry Products — Avoid scented detergents, fabric softeners or dryer sheets. Their fragrances can set off allergies. Choose fragrance-free laundry goods instead. • Dry Indoors — When laundry air-dries it magnetizes pollen and other allergens. And if it doesn’t dry completely, it’s vulnerable to mold and mildew. Stick to using the dryer, instead. The outdoors is booby-trapped with allergens, and so is your home. Progressive Air Systems can assist you in your efforts to control these household contaminants. As an ethics-driven family-owned company in business for 33 years, we provide professionalism with a personal touch. Put away those tissues and eye drops, and call us to discuss how our services can help you breathe easy.